The subject of argumentation has been studied since ancient times, but it has seen major innovations since the advent of the computer age. Software already exists which can create and evaluate arguments in high-stake situations, such as medical diagnosis and criminal investigation; formal systems can help us appreciate the role of the value judgments which underlie opposing positions; and it is even possible to enter into argumentative dialogues as if playing a computer game. 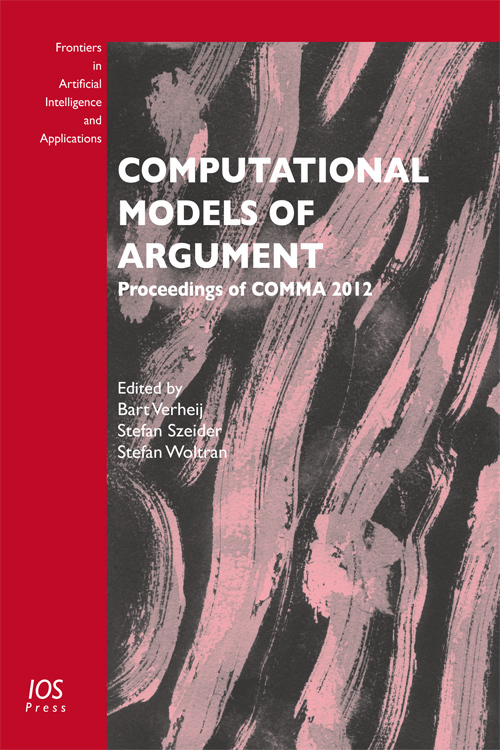 This book presents the 28 full papers, 17 short papers and a number of system demonstrations, described in an extended abstract, from the 2012 biennial Computational Models of Argument (COMMA) conference, held in Vienna, Austria. Papers by the invited speakers Professor Trevor Bench-Capon, Professor Erik Krabbe and Professor Keith Stenning are also included. This year, for the first time, COMMA invited the submission of papers for an innovative applications track, and those which were accepted for presentation are included in this volume. Argumentation can be studied from many angles, including the artificial, natural and theoretical systems perspective. Presentations at the 2012 conference addressed the subject from these perspectives and many more. Edited by: Verheij, B., Szeider, S., Woltran, S.